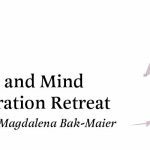 Being aware of Magdalena’s great competence and expertise I came to this course not quite knowing what to expect but also knowing it would be of the highest standard. What I found there far exceeded my expectations. Yes, it was indeed excellent – the design of the programme, the intelligence and creativity behind the themes for each day, the richness and diversity of the information imparted and the opportunity to practice new skills in a supportive atmosphere all meant that I experienced fresh insights, a deeper learning and some great new tools to add to my repertoire. But there was more than that – alongside Magdalena’s keen intelligence is a real humanity, a desire to connect authentically with each delegate, a genuine want on her part to make a difference to their coaching skills, to raise their level – and at the same time, to have fun! Maybe it’s her generosity of spirit, kindness, warmth – but my measure of a good learning experience is how it makes me feel about myself and I came away from the weekend feeling buoyed up and confident and actually more able to do my job.